Contrary to other hosted website builders, Sitemagic Cloud lets you connect your own domain free of charge. If you already own a domain that you want to use, you will need to first connect it to our service like described below, and then have your domain registrar update the domain to use our service, as described here: Move domain to Sitemagic Cloud. If you don't have a domain yet, please follow this guide to buy a new domain. The new domain will be ready for Sitemagic Cloud out-of-the-box. Once your domain is ready, connect it as described below. You can get a free domain useful for testing the domain services in Sitemagic Cloud. Read more about free domains here. Once you own a domain and has decided to use it with Sitemagic Cloud you should connect it immediately. If you want to move an existing domain to Sitemagic Cloud, be aware that this often requires the domain to be connected to Sitemagic Cloud first. 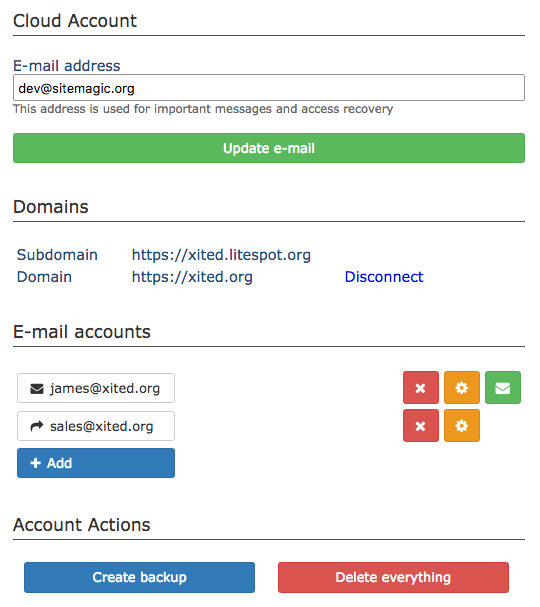 To connect your domain, all you need to do is log in to Sitemagic CMS and navigate to Admin > Cloud Account. Click the Connect link. The Cloud Manager will ask you for your domain name. Enter the domain name (e.g. company.com) and press OK to proceed. That's all. You will receive an e-mail once the domain is fully connected, which happens when the domain name is ready (purchase of new domain has been carried through or the existing domain has been moved to our services). It can take somewhere between a couple of minutes to hours or even days, so please be patient. Sitemagic Cloud tries to connect the domain 4 times every hour.